It is made with a sharp look for the price, it is comfortable with less steaming in the shoes. As a discontent, I am tired when walking around the factory without the cushioning property of the heel part. This review is about item#02460595. It is slippery on rainy days. Breathability seems good. How long do you have after? This review is about item#2460586. Only the right side hits the instep of the feet, so it hurts when you put on it. Do something. This review is about item#3339095. It was the worst product. When touching the end on the instep side, touching the corner on the foot side and the seam on the inside cloth are overlapped further, there is considerable pain because the corner rubs against the instep of the foot when walking. As soon as there was no substitute, I put up with it for two days but the pain on the instep of my feet was so bad that it hurt my garlic for a while after I took off. It is a shoe that is not safe to hurt your feet by wearing. Because it is a famous manufacturer, I bought it with confidence. I will not buy it again! This review is about item#02460552. Sense of size is just feeling to wear with a sense of just sneakers normal size. It is easy to wear with a wide Takashi Takashi. It is wonderful to work safely without slipping even on greasy places. However, water may be stained at the time of rain, but it may be unavoidable because the mesh fabric has good breathability. This review is about item#02460534. This review is about item#02460577. This review is about item#02460561. Light and comfortable to wear is very good. This review is about item#03339104. It is light and easy to move, not tiring. I constantly patronize it. It's light and breathable so it's a repeat. This review is about item#02460543. Work at machine assembling factory. Although I went to a store and thought about purchasing, I bought it online because it is troublesome. Although the person who purchased it by seeing the thing has a sense of security, although it is a net purchase, I thought that I would definitely regret if it was a cheap product too much, so I chose a product with a price as low as possible. I think that comfort is good. I feel a little steam, but I think that it is the fate of safety shoes. Anyway, it is light, so I am saved with less fatigue. The difficulty is that the cord is weak against chips and other heat. I always use it. Although it looks heavy Speaking of safety shoes was the image of "not so good", this safety sneakers is usually a favorite of shoes without anything of uncomfortable to use and as sneakers without worrying about the appearance. I do not know how to use it in a full-fledged ironworks etc., but it is recommended for those who work in track drivers and warehouses. This review is about item#03339061. There are always workers who are using this safety shoes. This review is about item#03339113. 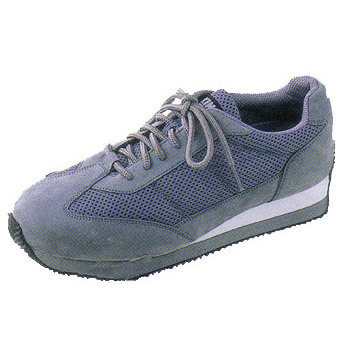 It is light and comfortable as ordinary sneakers, but it is useful because it does not slide on oil-stained floors.